AP Govt. Clarification of Non local & Local Candidates in AP Recruitment : AP Clarification of Non local & Local Candidates in DSC Recruitment , AP Educational department-DSC 2014 -provisional for Local /non local clarification -Regarding. From C & DSC AP, Hyderabad LR. RC. No 66/ TRC /2014, dated 9/ 9/ 2014. The attention of the Commissioner & director of School Education, AP. Hyderabad is invited to the reference cited. SCHOOL EDUCATION DEPARTMENT: non local & local clarification Memo No. 14846 , Dt: 2/12/2014. 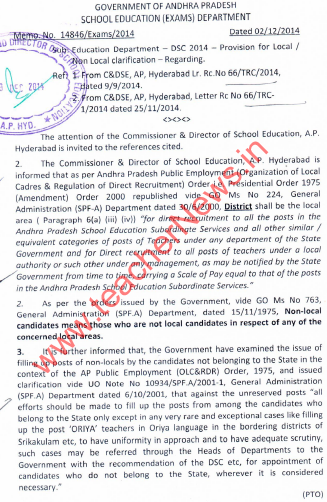 GOVERNMENT OF ANDHRA PRADESH SCHOOL EDUCATION (EXAMS) DEPARTMENT Memo- No. 14846/Exams/2014 Dated 02/12/2014 Education Department - DSC 2014 Provision for Local / Non Local clarification. Regarding: Ref 1 From C&DSE, AP, Hyderabad Lr. Rc. No 66/TRC/2014, dated 9/9/2014 from C&DSE, AP, Hyderabad, Letter Rc No 66/IRC- 1/2014 dated 25/11/2014 А.Р. HYD.The attention of the Commissioner & Director of School Education, A.P Hyderabad is invited to the references cited. 1. The Commissioner & Director of School Education area ( Paragraph 6(a) (ii) (iv) for direct recruitment to al the posts in the Andhra Pradesh School Education Subordinate Services and all other similar/ equivalent categories of posts of Teachers under any department of the State Government and for Direct recruitment to all posts of teachers under a local authority or such other under any management, as may be notified by the State Government from time to time, carrying a scale of Pay equal to that of the posts in the Andhra Pradesh School Education Subordinate Services. efforts should be made to fill up the posts from among the candidates who belong to the State only except in any very rare and exceptional cases like filling up the post 'ORIYA teachers in Oriya language in the bordering districts of Srikakulam etc, to have uniformity in approach and to have adequate scrutiny, such cases may be referred through the Heads of Departments to the Government with the recommendation of the DSC etc, for appointment of candidates who do not belong to the State, wherever it is considered necessary. 4.That being the rule position prior to bifurcation of state it has been clarified that the 20% posts or as the case may be meant for open category should be filled up only on merit of the candidates belonging to the State of Andhra Pradesh i.e. 23 Districts. On the same analogy, consequent That being the rule position, prior to bifurcation of State, it has been on bifurcation of State, Andhra Pradesh has become a separate State consisting of 13 districts and that 20% of posts or as the case may be meant for Open category, should be filled up only on merit basis either by local or non-local candidates belonging to the State of Andhra Pradesh consisting of 13 districts only, except in a very rare cases as mentioned in the above UO note. Further the Commissioner & Director of School Education, A.P. Hyderabad is also informed t instructions which were issued vide Memo No 29978/PE.SER.II/A1/2012, School Education (PE.SER.Il) Department, dated 20/12/2012 are in accordance with the provisions of Presidential order. 6. This clarification is issued in concurrence with GA (SPF.A) Department vide their UO No 17245/SPF&MC/2014 dated 25/9/2014. AP Govt. Clarification of Non local & Local Candidates in AP Recruitment 7 AP Clarification of Non local & Local Candidates in DSC Recruitment as per RC 14846, Dt: 2/12/2014.